It’s been raining for days. Seriously, days. All this week we’ve seen clouds up leading up to what is expected to be a sunny weekend. If I lived closer to the beach, I’d be worried. But instead of worrying, I’d much rather cook, be it breakfast for dinner. But really, who is going to ridicule me for having brinner (that’s code for breakfast for dinner) if I make French toast? Something I haven’t had in a really long time. Frankly, I’m not much for maple syrup, so I mostly steer clear from pancakes, waffles, and anything that might be covered in maple syrup. Shocker! I know. Being as I was raised in Vermont within smelling distance of the farms. I will eat it, just not in high volume. So having some maple syrup on hand, a craving for bananas and peanut butter, and a kitchen that was calling for breakfast past 6 p.m., I made an executive decision. I was making stuffed French toast. Peanut butter and banana stuffed French toast to be exact. Heat a medium-sized skillet on medium heat. Add butter. While butter is melting, beat egg, cinnamon, and vanilla extract in a bowl. Dredge one side of a piece of bread with egg wash. Place bread egg wash side down in the pan. On the second piece of bread, spread peanut butter and top with slices of banana (1/4 inch to half inch slices work well). Place that piece of bread peanut butter-side down on top of the bread already in the pan, making a sandwich. Take the rest of the egg wash and evenly spread it over the top of the “sandwich.” It’s okay if the egg wash gets into the pan, you can cut off the cooked egg later. Cook for about 4 minutes or until first side is toasted. Flip sandwich and press down on the sandwich with your flipper. This will keep the pieces together and help heat the center a bit. (I promise, this works.) Cook other side until golden brown, or for about another 3 minutes. Remove from pan. Slice in half, drizzle on maple syrup, and enjoy! 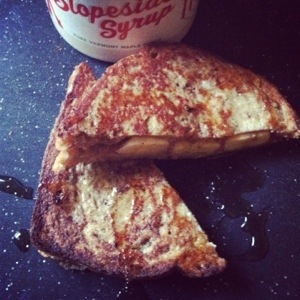 If anyone makes it, let me know what you think of if you have other stuffed French toast ideas. I think I’m going to make this a regular thing. Bring on the brinner! Love! Love! Love! Thank you! !